This morning the golden dome above the Shrine of the Báb was unveiled to the delight of viewers and this tour guide and shone with a new splendor above the city of Haifa. Photo credit: Baha’i World Centre photo. All rights reserved. The Báb, the precursor to the Bahá’u’lláh, was executed in 1850 in Iran and his remains were later laid to rest on Mount Carmel. The precise location was designated by Bahá’u’lláh himself to his eldest son, `Abdu’l-Bahá, in 1891. 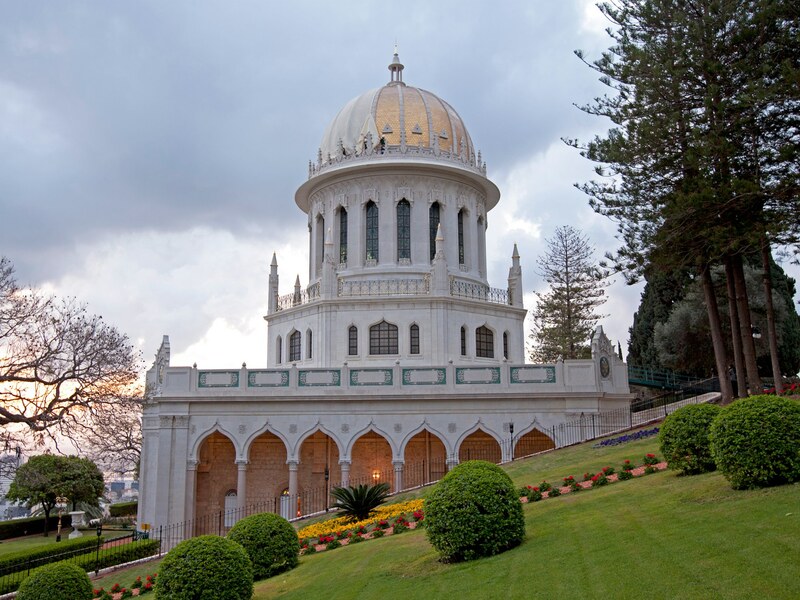 `Abdu’l-Bahá planned the octagonal structure crowned by a dome set on an 18 windowed drum, which was designed and completed by his grandson, Shoghi Effendi. The architect was William Sutherland Maxwell, a Canadian Bahá’í who was a Beaux-Arts architect and the father-in-law of Shoghi Effendi. Maxwell’s design of the Rose Baveno granite colonnade, Oriental-style Chiampo stone arches, and golden dome is meant to harmonize Eastern and Western proportions and style. Some remaining aspects of the dome’s structural engineering were designed by Professor H. Neumann of Haifa’s Technion University. The Bahai gardens and Shrine of the Báb is the second holiest site for Bahai, after Bahji, the Shrine of the Bahá’u’lláh just north of Akko. In 2008 an extensive project began to restore and conserve the interior and exterior stonework of the original 1909 structure, as well as measures to strengthen the Shrine against earthquakes. An entirely new retrofit design – combining concrete, steel and carbon fibre wrap technology – was applied to the building. More than 120 rock anchors were fixed into the mountain behind newly fortified retaining walls. Renovations were completed at a total cost of $6.7 million. This entry was posted in Architecture and tagged Bahai Gardens, postaweek2011 on April 12, 2011 by Shmuel Browns.